Jeff Bezos, Amazon.com's founder and the world's richest person, said on Thursday he will commit $2 billion to helping homeless families and starting pre-schools for low-income communities. The announcement marks a deeper foray into philanthropy for Bezos, whose fortune has soared to more than $160 billion thanks to his stake in Amazon. Dominance in e-commerce and the nascent field of cloud computing has made Amazon the world's second-most valuable public company. Bezos solicited ideas on Twitter last year for ways to donate some of his wealth. While he has financially supported cancer research and scholarships for immigrants, among other causes, Bezos has primarily devoted his fortune to his Blue Origin rocket company, which he described on Thursday as an "investment in the future of our planet through the development of foundational space infrastructure." His private ownership of The Washington Post, which has published articles critical of the White House, has also put him at odds with U.S. President Donald Trump. The new philanthropic effort is called the Bezos Day One Fund, a nod to the executive's management philosophy that organisations must view every day with the fervour of a new start, or face stagnation and decline. Within this, the "Day 1 Families Fund" will support existing non-profit organisations that offer shelter and food to young homeless families. The "Day 1 Academies Fund" will start an organisation to operate a new network of full-scholarship pre-schools for low-income communities. Citing the Amazon mantra of customer obsession, Bezos said in a tweet "The child will be the customer." Bezos said in remarks to the Economic Club of Washington that it is "really really hard" for a child to catch up if they fall behind in their early years. The money will pay "gigantic dividends for decades." He said he did not know how much money he would eventually give away. Bezos has yet to join "The Giving Pledge" created by fellow billionaires Bill and Melinda Gates and Warren Buffett, whose more than 180 signatories have promised to give more than half of their fortunes to philanthropy. 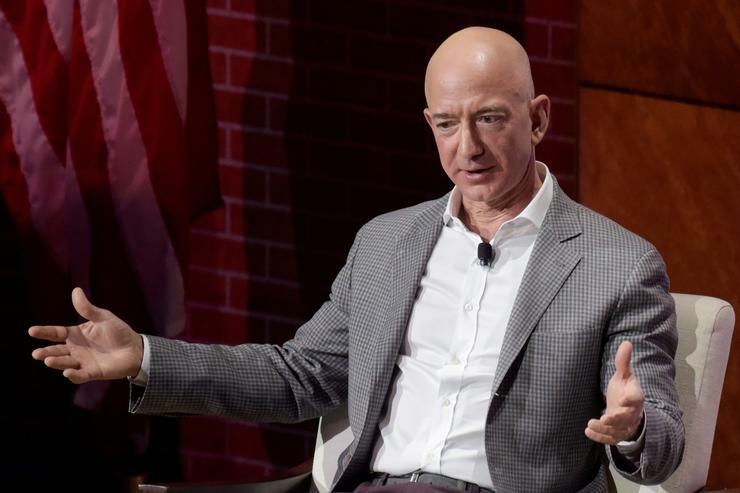 The Amazon chief's wealth has become problematic for some. Earlier this month, U.S. Senator Bernie Sanders, a self-described democratic socialist, proposed a bill in Congress called the "Stop BEZOS" Act, which would make large corporations pay workers more or pay for public assistance programs like Medicaid. Amazon has said Sanders' statements about the company were "inaccurate and misleading." Reporting by Munsif Vengattil in Bengaluru and Jeffrey Dastin in San Francisco; Additional reporting by David Shepardson in Washington Editing by Shailesh Kuber and Paul Tait.